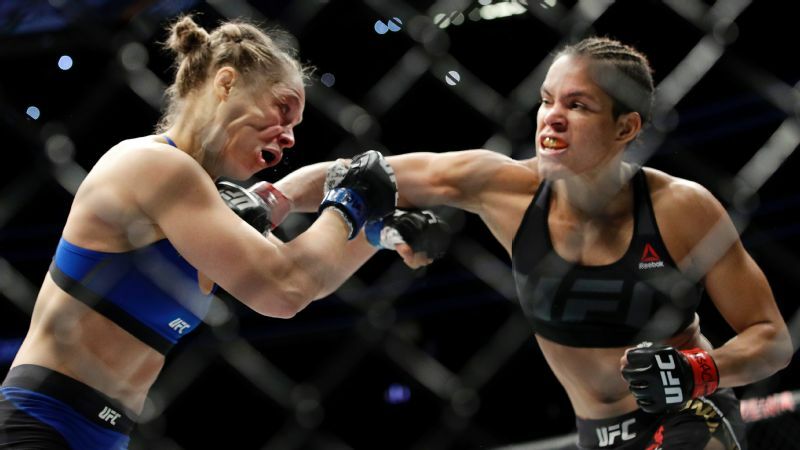 Ronda Rousey once dared to venture inside Amanda Nunes' punching range and paid the price. 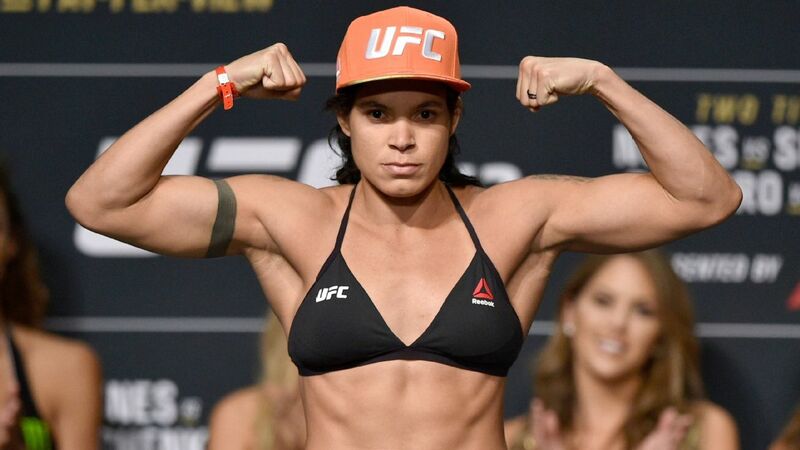 In the main event of UFC 224, women's bantamweight champion Amanda Nunes will look to make her third title defense a success against challenger Raquel Pennington on Saturday. In many statistical categories, Nunes and Pennington are basically even. However, there are some key areas where the numbers differ drastically. The following is a look at the statistical categories that highlight these differences and could turn out to be the determining factors on fight night. In terms of surface-level striking stats, there is not a lot of separation between Nunes and Pennington. One of the biggest divergences comes in striking differential -- i.e., significant strikes landed per minute (SLpM) minus significant strikes absorbed per minute (SApM). Nunes holds a +1.39 differential per minute, while Pennington's is +0.89. Defensively, both fighters allow their opponents to land at basically the same rate: 2.89 SApM for Nunes and 2.92 for Pennington. However, Nunes sets herself apart from the challenger with her offensive output. The champion lands 4.28 significant strikes per minute, while Pennington's offensive production lags slightly behind at 3.80. While Nunes may have landed at a higher rate during her UFC and Strikeforce career, the stats seem to portend a close striking battle. While the striking stats are very close across the board, Pennington does seem to have an advantage in clinch striking. During her UFC career, she has landed 26 percent of her significant strikes in the clinch, compared with only 8 percent for Nunes, who does a large majority of her striking at distance. That being said, forcing Nunes into a clinch position is not the easiest task. Former champion Ronda Rousey memorably learned at UFC 200 that recklessly trying to enter the clinch against Nunes without a proper setup can be disastrous. 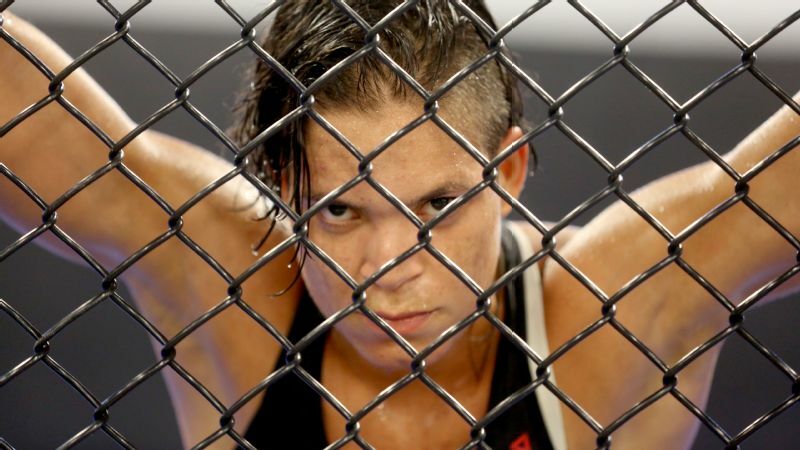 If Pennington is able to close the distance and clinch with Nunes, she might be able to outland her opponent. However, she needs to be very cautious to avoid distance strikes on the entry. 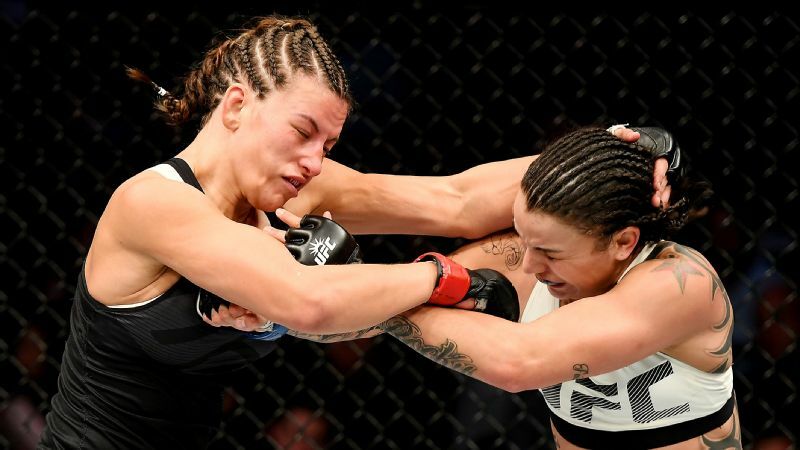 Raquel Pennington, right, does her best work when she gets up close and personal with her opponent. Like most fighters, Nunes and Pennington land a majority of their significant strikes to the head of their opponents, 63 percent and 64 percent, respectively. However, their choice of secondary target is rather disparate. Pennington's secondary target is the body, where she has landed 23 percent of her significant strikes. "Rocky" rarely goes to her leg attacks, which have accounted for only 13 percent of her significant strikes. By percentage, Nunes' top secondary target is her opponents' legs. During her combined UFC and Strikeforce career, she has landed 27 percent of her significant strikes below the waist. However, the stat is somewhat misleading. Nunes landed 68 of her 88 career significant leg strikes in her two fights against Valentina Shevchenko. Outside of those fights, the champion has basically been a headhunter. If Pennington can vary her attacks by landing to the legs and body, she might have an advantage and improve her chances of pulling off the upset. One of the biggest contrasts between Nunes and Pennington is their time in the cage. Nunes' average appearance has been 6 minutes, 57 seconds, while Pennington has averaged over two rounds per fight at 13:07. While Nunes has been scheduled for 25 minutes on multiple occasions, she has gone to a decision in a five-round fight only once. On top of that, nine of her 11 fights in the UFC and Strikeforce have been finishes. On the other hand, Pennington has only two finishes in her eight-fight UFC career. Pennington might try to rely on her durability and push this fight into the later rounds. However, despite her limited experience in longer fights, Nunes is coming off a 25-minute decision victory over Shevchenko.